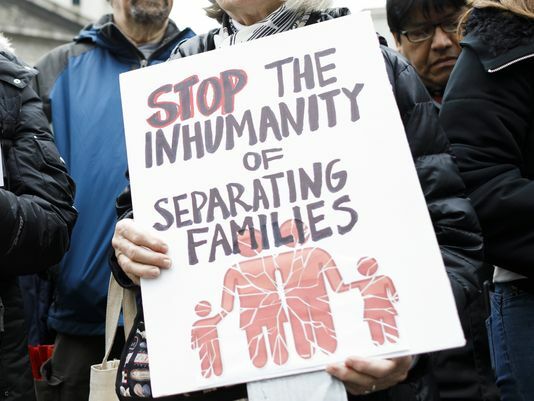 Families seeking asylum at our southern border are being deliberately separated due to a zero-tolerance policy that makes all adults illegal, incarcerates the adults, and sends children, sometimes infants in arms who are breast-feeding, to a detention setting. This is not just a number. This is a living, breathing baby whose only source of nourishment is its mother. The baby probably has no idea how to take a bottle. Torn from its mother’s arms, it will cry uncontrollably, will be unable to eat, and could very likely die due to this kind of treatment. This is a criminal act. The Trump administration has said that this horrific policy is being undertaken to deter asylum seekers. What have we become as a nation? How is it possible that thousands are not gathered at the border to protest these policies. These are CHILDREN – children who are brought to this country by desperate parents fleeing for their lives. Children who are traumatized carry the results of these experiences in their own DNA. The Adverse Childhood Experiences research study (www.acestudy.org ) has proved that these kinds of events have long-lasting effects on the physical and mental health of children long into their adulthoods. Any competent mental health professional knows that the effects of attachment disruption is profound. The United States is wrong. The world is watching. I will contact my representative and senators. I will protest this injustice. I will support with donations organizations that are attempting to serve these children. Communications and relationship specialist, counselor, Imago Relationship Therapist, businesswoman, mother, proud native Nashvillian – in private practice for 30+ years. I have the privilege of helping to mend broken hearts. Contact me at http://www.susanhammondswhite.com. Like what you’ve read? Feel free to share, but please…Give HerSavvy credit. Thanks!